The truth about the family courts gives the lie to some cherished American assumptions. Americans believe they are safe from arbitrary abuse of governmental power—yet child protective services, “law guardians,” and family court judges can cast aside the norms of due process . 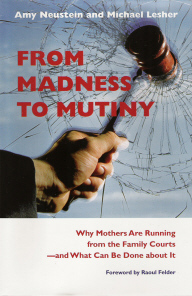 . .
From Madness to Mutiny: Why Mothers Are Running from the Family Courts—and What Can Be Done about It (University Press of New England, 2005). Michael Lesher, Esq. is a writer, journalist and attorney who provides unique legal services to mothers and children navigating the dangerous terrain of the family court system. He has performed legal work for pro se clients, and for other attorneys, in states all over the country, including Arizona, Colorado, Idaho, Maryland, Michigan, New Jersey and New York. Many of these cases involve mothers who have lost custody of their children because of their efforts to protect the children from alleged sexual abuse. Michael Lesher has also handled federal civil rights cases concerning freedom of speech and equal protection under the law. ... essential reading for any health or mental health professional or legal advocate for children. “This motion gives this Court an opportunity to undo a grievous wrong—one which no other tribunal has had the capacity to rectify. This Court finally has the benefit of a full record on which to base its judgment. In the light of that record, this Court—at last—has the opportunity to erase a tragic error that has tainted for too long a decision of this Court, not to mention the lives of a victimized mother and an innocent child.” —from legal papers written by Michael Lesher. “Modified sole custody ... is modified to provide for [the mother] as the legal custodian ... I want this child to feel that she has a safe place where if necessary she can talk about her feelings, about what is going on in her life ... without having to worry about being a go between [the parents].” —from a decision granted in favor of a mother who had lost custody due to suspected sexual abuse by the father, and whose legal papers were prepared by Michael Lesher. Michael Lesher has also been deeply involved, as a writer and a legal activist, in the issue of child sexual abuse within his own Orthodox Jewish community. He is now the author of Sexual Abuse, Shonda and Concealment in Orthodox Jewish Communities (McFarland & Co., 2014). In addition to the new book, apart from what is contained in the publications, legal work and press entries found on this site, some of Michael Lesher’s ideas on this subject can be found in an earlier essay, “The Disposable Jew: Reflections on Child Sexual Abuse and Religious Culture,” written some time ago but never found “suitable” for publication by editors of today’s Jewish journals or book publishers.